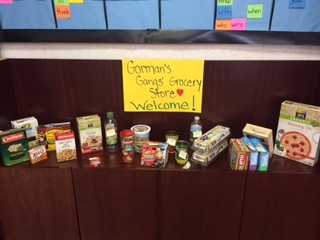 The kindergartners are proud to announce the grand opening of their new grocery store: Gorman’s Gangs’ Grocery Store. We are currently open for business Monday- Friday during regularly scheduled school hours. Upon our opening, each student received a bag of dimes and pennies which they keep in their desks and use to grocery shop a couple of times a week. Each child had to determine if he/she had enough money to pay the labeled price of each item, or multiple items, pay the exact amount to the cashier, and receive a receipt so they can keep track of their purchases. Students are learning to add two, two digit numbers without carrying! It is exciting to see! Along with learning how to add coins, they are realizing that you cannot buy everything you want, and that sometimes you need to wait until payday to go back and purchase certain items. This project is not only a fun way to meet one of our mathematical goals, but an opportunity to create a real life experience! Everything we have, or obtain, is truly a gift from God.